How to glitter your walls - Glitter My World! If you have been doing any research on the internet about this you have no doubt figured out that there are lots of ways to do a glitter wall. There are different looks and methods for each look. On this page, we have given you a bit of data to help you decide which method you might want to use. Before you dive in- always test, test, test, before you begin your project. Materials and glitter vary and so do the results! This method seems to be a favorite with DIYers. Basically, you take PVA glue or Mod Podge Gloss and pour it into a container. You then mix your glitter into the glue until it comes out thick and fairly chunky. Using a sponge brush/paint pad or plastic putty knife, you smear the glue/glitter mixture onto the wall. If you miss any areas you can go back over it and fill them in after the glue has set or dried. The final product will be a textured very glittery wall. The glitter does not flake off because the glue has trapped it. The result is full coverage. Tip: If you take the time to paint your wall the color of the glitter you will be so much happier with the results. If you have small gaps between the glitter your eye will not really see them. Coverage: This method uses a lot of glitter. You should estimate 1-2 oz per square foot at least. Fun Option: Some people who want their wall to be "over the top" mix both fine and larger flakes together for extra glitz. Note: This method of coating is really messy so tape off any molding you may have to go up against and also get a drop cloth on the floor! 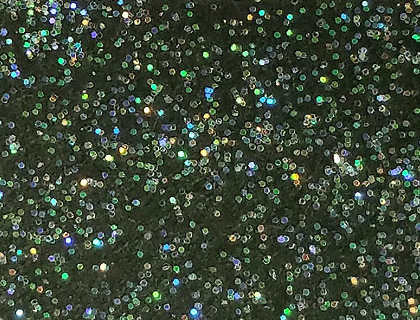 Flake: OK to use Craft Glitter in any flake size (unless you expect direct sunlight exposure- craft glitter fades in sunlight over time). The 0.040 is recommended for a glitzy look, but it really is a personal choice. If you can afford to go with Polyester Glitter then you might consider it in the ultra fine 0.008. You will end up with a classier look, less texture and better UV resistance. Final Note: If you ever need to get this glitter off your wall this is going to be a huge issue and will either require someone to texture over the glitter or you will need to replace your wall. Simply painting over it will really not work in most cases. Just something to keep in mind. 1. Paint a section of your wall (make sure the paint is the main color you want your wall to be- you are going to see a lot of it). 2. Place glitter onto a tray, plate or hand. 3. Blow the glitter onto the wall. 4 Repeat until the wall is covered with glitter. 5. Seal coat with a roll or brush on clear sealer or glazing. Result: The glitter does look blotchy and uneven. This may or may not be the look you are going for. It tends to give the wall a bit of an antique look. Coverage: 1/4 to 1/2 oz per square foot. Tip: Tape a clear plastic tarp to the baseboard of the wall to catch falling glitter so you can scoop it up and re-use it. Flake: For dramatic sparkle go with 0.040 Chunky, for a more subtle classy look then the 0.015 or 0.008 is a good choice. Smaller flakes are easier to blow. Sealer: You will need to use a seal coat to fully trap the glitter. It should be applied only after the paint as fully dried. If you used Craft Glitter be sure to use a water-based sealer or glaze. If you used a Polyester Glitter you would generally use a non-water-based sealer. We are a big fan of clear glaze. Note: Glitter can sometimes bleed into the sealing product. Be sure to test first if this is something that will bother you. Option: There is a cool option that you can do with your paint coat. You can take two or more colors of paint and do a treatment such as a simple marble. It is fast and easy and can be quite effective. Put the paints on thick so when you blow on the glitter it really sticks. When you do this marble paint effect, it makes the glitter look a lot less blotchy and more appropriate when it is not uniform across the wall. Image below is a simple rag roll marble. This particular paint color choice would look good with a fine golden flake or a copper flake mix blown onto it or a glaze coat brushed on. This is the fastest way to do a glitter wall and probably one of the best for full coverage. However, it is toxic so have good ventilation or even better use a respirator! The glue you will want to use is 3M Super 77. It is an industrial grade spray glue. You should spend time taping off mouldings, door jambs, floors and anything that should not be sprayed. When you are ready to spray, start at the top of your wall and spray heavily in one area (maybe four square feet). Put disposable gloves on your hands and grab a handful of glitter. Liberally throw the glitter at the wall and then use your hand to rub even more of it into the open spots. Smear the glitter all over the glue surface until you have full coverage. The can says to wait and let it get tacky- NO! In this case, apply the glitter asap when the glue is wet. Take a dry brush and run it over the surface to remove any flakes that want to come off. Once you have completed covering the wall you will want to let it dry for a bit and then clear coat seal the wall. If you used Craft Glitter then you will need to use either PVA glue, Mod Podge or a water-based clear sealer. If you used Polyester Glitter you can still use these products, or you can also use Krylon Glitter Blast or any number of non-water-based sealers. Glaze also will work well. Tip: Tape a clear drop cloth to the baseboard to catch the falling glitter and re-use the glitter. Tip: Base coat your wall with paint that is the same color as your glitter (recommended). Doing this step will really pay off if you want the look of total coverage. Just make sure the paint is very dry before spraying glue on it! Coverage: 1 oz will just about cover 1 square foot (full coverage). Patch: Have some open areas? Carefully spray the area (use a paper mask to keep the spray glue in just the spot you need). Then glitter that area. Try not to overspray. The glue knocks shine off of glitter. Flake Type: If you are doing the clear seal coat with a water based sealer then you can use Craft Glitter (cannot come in contact with solvents and related substances). If you clear coat with a non-water based sealer then you need to use solvent resistant Polyester Glitters. Flake Size: Flake size is a personal choice. For big sparkles use bigger flakes. For a more subtle look, you can use smaller flakes 0.015 or 0.008. You can also mix flakes for added interest. Sealers: Plan to do at least 2 clear coats over your glitter. The first one will really trap the glitter and the second will give you a smoother feel to the wall. Keep in mind- the more coats of sealer (especially glues) the less sparkle you will have. RUSH? : In a big hurry? Maybe your shop or store is about to open and you need to get this wall done fast? If you are, you can pretty much immediately do several coats of Krylon Crystal Clear Gloss or Krylon Glitter Blast right after the glitter goes on. The spray will not necessarily trap the glitter completely, but it will do a pretty good job short term. Eventually, you will want to roll on or brush on a coat of clear sealer. These sprays are really only OK for Polyester Glitters. Spray sealers like this can damage Craft Glitters if put on too heavy (it can melt the surface). Mixed Into Paint: If you choose to mix glitter into paint be sure to only use the glitter that is specially formulated for paint. We can give you the entire scientific reason why some glitters work and others don't if you give us a call and ask. It has to do with metal, water and off-gassing. It also doesn't look that great. The glitter gets coated with the paint and you only see a little bit of the sparkle. So, we recommend either going with the commercial glitter additives that are out there or the pre-mixed glitter wall paints. Neither of these choices gives you a dramatic glitter effect. It is subtle and if that works for your application, go for it (it's certainly easy!). 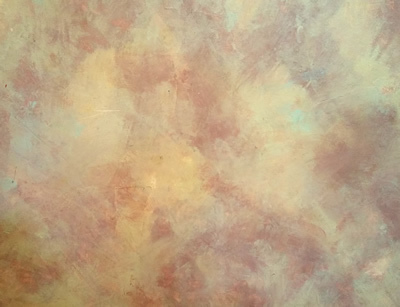 ​​Accent Coating with Glaze: What we like to do is a glaze coating that is put over the painted wall. That clear glaze coat would have glitter mixed in and then brushed on. How to do a glaze coat- You should let your regular paint coat dry completely OR if your wall is already painted make sure it is very clean. Polyester Glitter: Do one (or more) coats with the glitter mixed in. You can do all the same color glitter or one coat with one color and another coat with second color. Or two flakes done in two coats. Craft Glitter: Test before you use it. Some craft glitters may bleed into the glaze. Also- craft glitter fades in sunlight over time. Our favorite effect is using iridescent glitters over black. It really pops (see image below). ,Craft Glitter can be used for glitter walls as long as they do not come in contact with solvents or prolonged sun exposure. If it does, it will melt and or bleed. It can come in contact with Super 77 Spray Glue, but only when the glitter is placed on top. Never spray Super 77 on top of the craft glitter or it will ruin it. You will not be able to mix it into epoxy, polyurethane, lacquer or related. Water based only products are what you would need to use with this type of glitter. Even then the colors can sometimes bleed so test! Flake Size: Rule of thumb with flake size is always- the larger the flake the bigger the sparkle. If you are looking for over the top glitz then larger flakes will give you that. If you look is more classy or subtle, then going with Ultra Fine is perhaps a better option. If you are buying glitter from us you will see that every glitter listing will give you the flake size and an image that looks like the one above (only blown up). 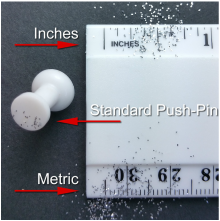 You can use the image to really see the flake size and determine if it will work for you. Bleeding: All glitters have the potential to bleed their colors. This is why we always say test, test, test! Always do tests before you jump into a glitter wall project. You don't want to take your lovely wall and have glitter color bleeding all over. Not all color and types do, but it can happen. Please get samples and test! Glitter sparkles because of light. It is really that simple. This means if you have a dark room and you glitter the walls you really won't see the glitter. Keep that in mind when you design your room. If you plan to glitter one wall only, then make sure it is the one where sunlight hits or is closest to the ceiling lights. No windows or built-in lighting? Plan to have some clever direct lighting or lamps that are super close to the wall. If you want the sparkle to show, you need to think about the lighting just as much as getting the glitter onto the wall!